LED Laptop USB Light - Cheap! An inexpensive alternative to wasting electricity by using overhead lights when it’s not necessary. This LED Laptop USB Light is cheap! For just a few bucks you can save the world AND see what you’re doing! I don’t know about you, but this is perfect for me. It never fails, I type 80 words per minute – but as soon as I turn the lights off my fingers turn into bumbling fools – slapping around like 1/2 dead fish trying to find home row. I don’t even look at the keyboard, but I can never find the keys in the dark – so strange! 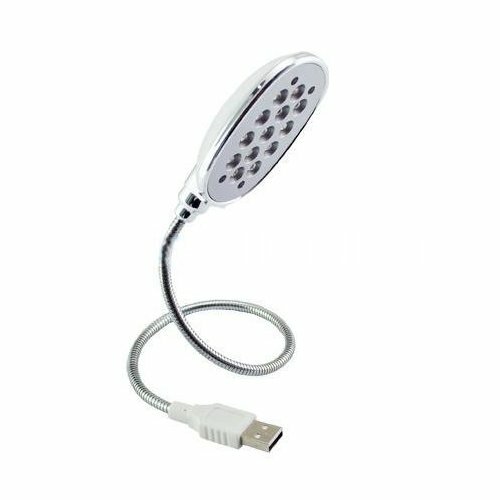 This LED USB Light plugs right into the USB port on your laptop and the flexible cord wrap holds the lamp in what ever position you put it in. Whether you’re a traveling business man and need the light for working on the plane, a student who has a roommate that sleeps all the time, or you’re just looking to do your part to conserve electricity – this LED Laptop Lamp is for you! Order today – it’s cheap, practical and exactly what you’re looking for.